White Bits and other musings! What can I possibly write about today? It’s been two days since my last blog and my head is overflowing! Let me start by announcing that we have moved pitch, we are no longer on the Pigeon Firing Range! So today, Harry is gleaming again. Apart from his roof, which we can’t reach, but we can’t see it either so – out of sight, out of mind!! We have also just celebrated our 33rd Wedding Anniversary, and yes I can understand how startled you must be, I was a child bride!! Of course I don’t look old enough to have been married for 33 years! That’s more than half of my life, and it seems as though it’s gone by in a flash. We marked the occasion with a lovely meal, sat outside Harry, with a bottle of wine and some candles burning. It was really special and peaceful as most of the campsite had taken themselves off to bed and closed all their blinds in order to keep the midges and mosquitos out. Our anniversary is actually on Thursday but as the Hubster always seems to work on high days and holidays we are used to adjusting the calendar to suit our needs! 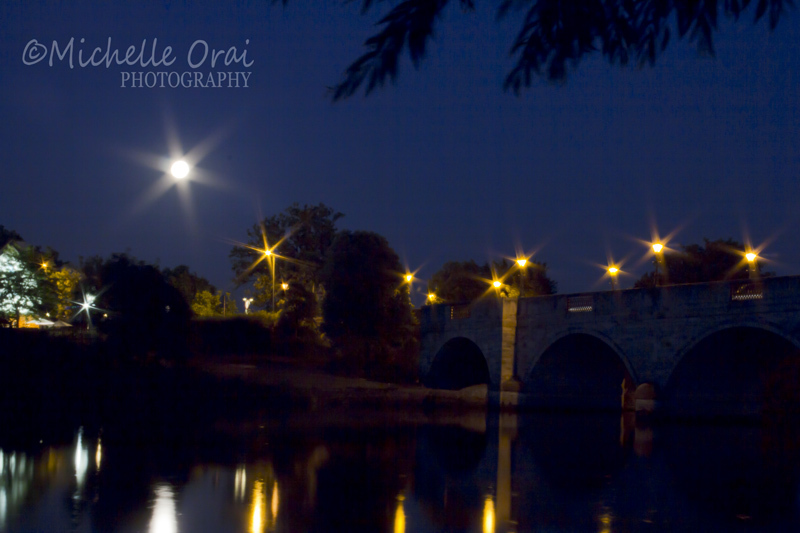 A couple of nights ago, one of the wardens told me of a view to capture with my camera, the bridge under the moonlight. Sounds easy eh? I wandered off in my flip flops and PJ’s, well I was just getting ready to go to bed! I squeezed in between two pitches being very mindful not to wake the inhabitants! I set up my tripod, oh my goodness, it was pitch black so I fumbled in the dark to set all the settings on the camera with the help of my lighter!! Not to be recommended! I wasn’t absolutely sure of the correct settings as it has been such a long time since I took any night shots. I connected the remote control switch and counted the seconds until I thought I had left the aperture open long enough to capture the scene. It was beautiful but as I was stood holding on to the remote I would dive every now and then as bats came flitting by just inches from my head! It’s quite amazing what I’ll put up with in order to capture a photo! Here are the results! Not too shabby eh? 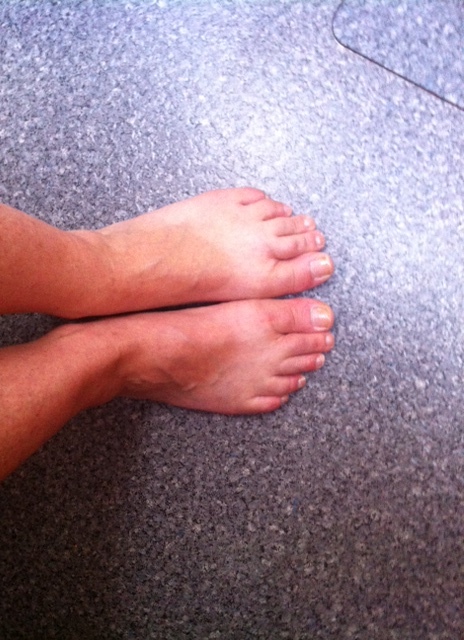 The other thing that has delighted me this week is the state of my feet! We have been so fortunate with the weather since we moved into the van, and as a result I’ve been basting nicely without even trying!! Hallelujah!! I have white bits. I can’t believe it! As my husband is originally from Iran, he always has a lovely tint to his skin, so on holiday he turns the most beautiful colour by Day 2, no protection, no creams, no burning, just ‘Ta-Dah’, a beautiful bronzed Adonis appears! Lucky me you may be thinking, hell no, it just makes me look even whiter!! It takes me a good two weeks to start to turn! I always joke and say I look like the middle-aged, white, woman who’s “got off” with a waiter! You know you see these lovely, lithe, slim, golden girls with legs that start at their necks, they have beautifully, golden, even, shiny tans, they walk effortlessly on hot sand (do they have asbestos feet? ), they have no white marks,(how do they do that? ), they glide into and out of the water like sea nymphs. I on the other hand, for some explicable reason, perspire, when it’s hot! My hair gets stuck to the nape of my neck, I apply liberal amounts of sun protection that the sand then sticks to, which, in turn runs from my brow into my eyes and stings like hell, turning them a delicate shade of pink. Walking on the hot sand is a whole other challenge – I skip, hop and jump as the heat sears into my feet, all the while trying to hold all my wobbly bits in place, it’s quite a skill and I have yet to master it! As I emerge from the water I look and feel like the monster from the black lagoon, I’m no Ursula Andress! And so I flop back onto my sand covered towel where I end up itching and scratching! By the time I leave the beach I’m exactly the same colour as when I arrived full of hope in the morning, I tell myself I’ve had a wonderful time but in all honesty it’s pretty miserable. So to have white bits and not have tried is a triumph! 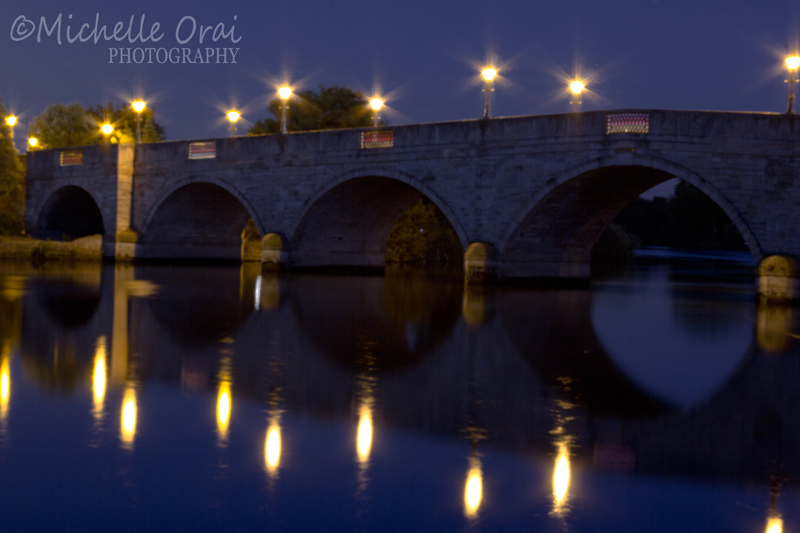 This entry was posted in Daily life, England, Hidden Gypsy, motorhome, motorhoming, Photos and tagged beach, bridge, celebration, Chertsey bridge, England, hidden gypsy, Night photography, Photography, Sunbathing, sunshine, suntans, tan, Wedding anniversary. Bookmark the permalink. Funny yes, True also, I hate going to the beach I always feel extremely ugly and lardy!! Much better tinkering with the van and getting brown at the same time!! Hahaha… you gave me a good laugh… asbestos feet!! I proudly wear my pasty white skin. I do not like the sun ever since I was a kid, around 10 years old, on a family vacation in Florida. My mother smeared me head to toe with baby oil, set me on a aluminium type blanket (yes, it felt like being a turkey in the oven), placed me optimally under the sun and let me baste until I was so red I looked like a lobster! Instead of tanning I wound up with sun poisoning, spent 2 days in hospital, and ever since then have avoided it like the plague. Blimey Yvonne. It sounds like you live in a forest! It is lovely to see all the wildlife. I once found an incredible insect I think it was called Devils coach horse or something similar, it looked just like a scorpion. I’ll see if I can get a photo and post it up for you. I’m so glad your friend is enjoying my blog.